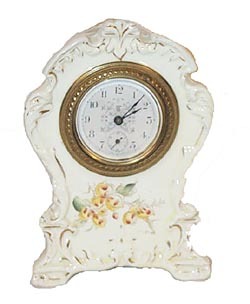 Waterbury Clock Co., porcelain case, "Boudoir No. 203", ca 1899. Cream colored case with gilt and flower decorations. 2 inch ornamental dial with subsidiary seconds dial. The movement and dial are signed Waterbury ClockCompany. Case is 6-1/2 inches high, nice brass sash and dial ring. Thereare no breaks or repairs, near perfect. A big bonus, it is running strong.Ly-Waterbury No. 2043.